Get Out and Garden to Save the Planet! I think I've mentioned before that I have the opposite of a green thumb. I kill everything. Herbs, houseplants, cacti(!). Even cut flowers don't last long around me. Maybe because I have three kids, it seems I cannot handle one more living thing that requires something from me. So pets are out of the question, and even plants suffer passive-aggressive neglect. Which means it's up to the rest of you to save the planet. The good news is, I'm reading a fascinating book about how easy it will be to do. We knew plants were a good deal, global-warmingwise, locking away climate carbon dioxide as fast as they could grow, but who knew what an integral role healthy soil plays? 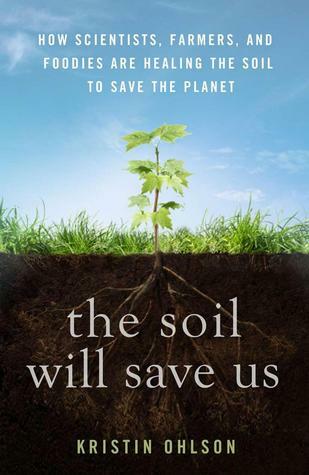 According to author Kristin Ohlson, a mere teaspoon of healthy soil contains 1-7 billion microorganisms--bacteria, fungi, protozoa, tiny worms called nematodes--all doing their microscopic part in "one of life's great biological partnerships." From the roots of the plant, "the microorganisms [receive] precious carbon sugars as well as protein and carbohydrates"; in return, they break down minerals in the soil and supply it to the plant. The minerals allow the plant to add mass (i.e., grow bigger and sock away more carbon for us). So long-evolved and specific is this system that 99% of soil organisms cannot be grown in a lab. Different ones come into play at different times, depending on temperature and moisture levels. Not only do the plants store carbon, but the soil does as well. Carbon richness gives healthy soil that black, crumbly appearance, like Oreo cookie crumbs after a soaking in butter, before you shape them into cheesecake crust...ahem--but I digress. When healthy soil washes or blows away, due to plowing(!) or poor land management, all that carbon gets returned to the atmosphere. Ohlson writes that, "up until the 1950s most of the excess carbon dioxide in the air resulted from the ways humans used their land and forests." Certainly the Dust Bowl contributed mightily, when thousands of acres of soil blew away, after being plowed and exposed to merciless drought. Without the prairie grasses and their roots to tamp everything down, it all just took off in the next gust. As much as 80% of the carbon has been depleted from soil, in places where people have farmed for millennia, but even more recent farmlands such as Ohio have lost 50% of their soil carbon in just a couple centuries. Alarming news, but not irreversible by any means. If we can replenish the carbon in depleted soils and preserve the rich soils that remain, Ohlson argues that we can dial back the thermostat on Planet Earth. Let the earth's natural systems regain the balance! It's enough to make me want to rip out the kids' play structure and let the blackberries take over. How can we keep those precious organic systems in place, where soil is still healthy? Practice no-till farming. Don't overgraze. Leave organic mulch in place to hold soil down and feed it. And what about the depleted soil? How can it be restored? Some of the solutions discussed in the book include controlled grazing (animals = poop and biomatter crunched into the soil); no-till farming; cover crops; and no artificial inputs. Let the multitudinous bugs come back, and a few weeds. One study found that, when a field was covered in a 2-3 species cover crop, sediment runoff decreased by 90% and fertilizer runoff by 50%! Healthy soil filters water before it enters streams and aquifers. It mitigates flooding and wildfire. Its ability to store water, because it is not compacted, allows the plants it supports to resist drought. Good stuff. The optimism of this book made me want to run out and start soil farming, but Ohlson points out that even we city-dwellers can contribute. American lawns constitute the largest irrigated crop in the country, occupying 3x the space of corn. We can build good soil right where we live. Let a little clover intermix--it's a nitrogen-fixing legume which makes added fertilizer unnecessary. (Made me wonder if our big patches of moss were also helping...) And, her second suggestion: compost compost compost. In Bellevue we're fortunate that our city will compost for us, if we're too space-limited or lazy, but since I write this the day of the Mariners home opener, I will also mention Safeco Field's awesome composting efforts. Last season at a game, local Cedar Grove handed out bags of soil made from yard waste. Since the Mariners had gone down in flames that day (or petered out with a whimper, more like), the bag of soil almost made up for it. What could this year be like? A winning team and richer soil that might just save the world.